I didn’t think my beloved grilled cheese from childhood could get any better, and then someone introduced me to paninis. My adult self has since upgraded with these scrumptious Chicken Cordon Bleu Paninis. 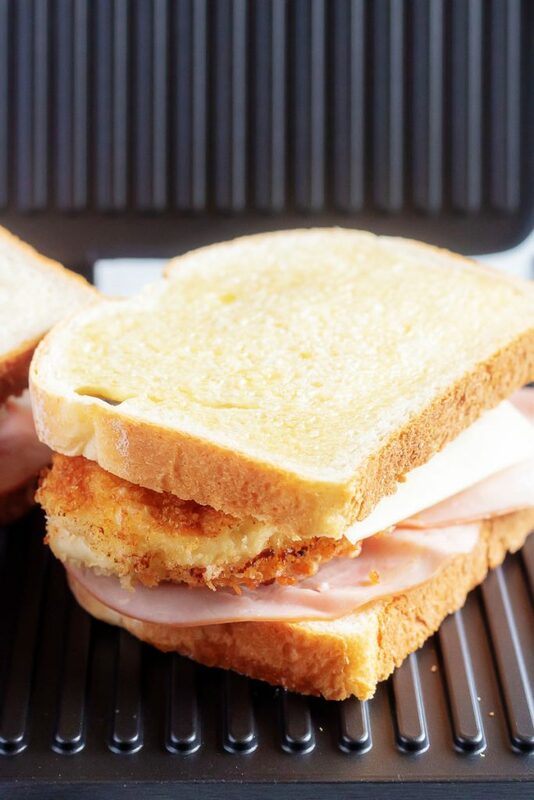 They combine crispy, fried chicken cutlets, melted Swiss cheese, and sweet ham slices into a gourmet sandwich that’s a beauty to both behold and to savor. We love Chicken Cordon Bleu. And how could you blame us? I don’t know many people who could resist a crispy chicken breast stuffed with ham and oozing melted Swiss cheese? And while most people are familiar with at least the basic concept of the original stuffed and pan fried version, we haven’t stopped there. We love all things cordon bleu. All. The. Things. Especially our pinwheels version, and in the colder months we really enjoy turning it into a hearty bowl of soup for supper. But we can’t ever seem to stop. We’re always on the lookout for those fun new ways to enjoy old favorites. 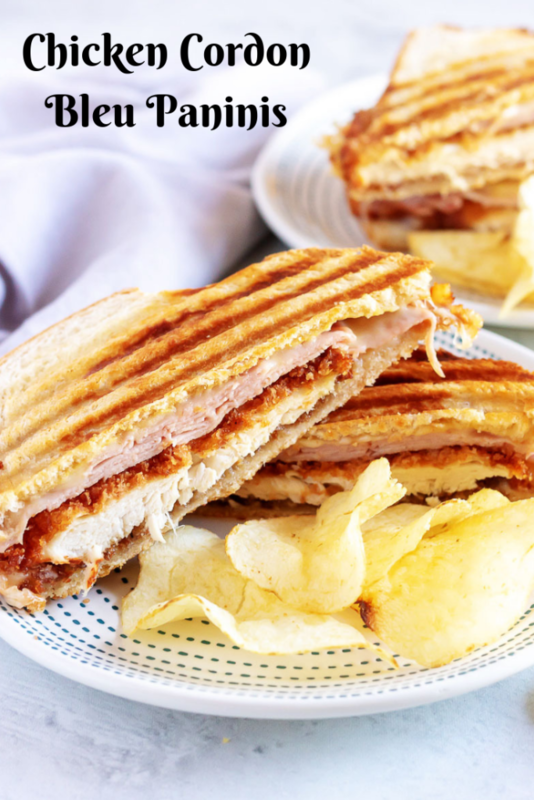 And thank goodness for it, because it’s how we stumbled onto this Chicken Cordon Bleu Paninis sandwich idea. Very few would argue that there’s anything more comforting on a plate, than simple toasted slices of bread sandwiching gooey, gooey melted cheeses. It’s like the stern, borderline mean food critic in Disney’s Ratatoullie. One bite- and we’re all swept away, lost in comforting edible memories from our childhood. It’s hardly a new concept. Similar style sandwiches were mentioned in Ancient Roman texts, and we can’t forget that the French have been making their Croque Monsieurs for at least the last century or two. Thankfully for us, the sandwich became revitalized and wide spread in the 1920’s with the invention of the bread slicer that made distributing pre-sliced bread a breeze, and Kraft’s invention of commercialized ‘American’ cheese. The humble grilled cheese became the comfort food of households all across the states, households worldwide even. Then commercialized bread got even easier to slice and distribute. Along with lunch meats, different cheeses, even chicken. Let’s not forget the advantageous invention called the panini press. 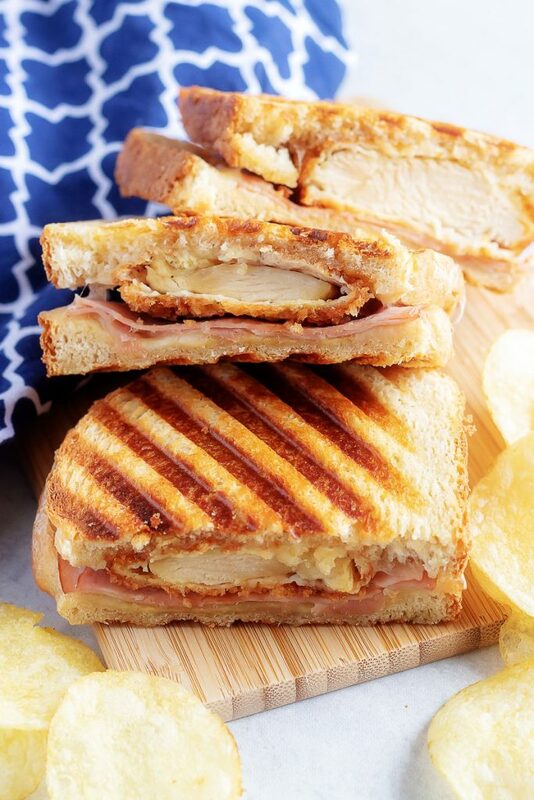 All these things come together in a single, glorious, rich sandwich invention called Chicken Cordon Bleu Paninis. If you haven’t had one, one bite will sell you on there merit. They deserve to be on the dinner table. They’ve more than earned there place in edible history. Despite blending a variety of flavors into a complex flavorful masterpiece, this sandwich is surprisingly simple to throw together. Even in a pinch! Chicken cutlets are seasoned liberally with salt and pepper before being coated in flour, dipped in an egg wash, and then coated with crisp panic bread crumbs. They’re then transferred to a skillet full of hot oil. Cooked for about four minutes on both sides, they’re removed to a paper towel lined plate when golden brown on both sides and cooked through. Thick ciabatta rolls are cut in half lengthwise, and buttered on both sides. Yes, both sides. Top and bottom. Dijon mustard is then spread on the inside of each bun. Creamy, sliced Swiss is layered on the inside of each bottom bun, topped with sweet ham slices. A crispy chicken cutlet is added next. Another slice of cheese or two, and the sandwiches are closed, topped with the top bun. 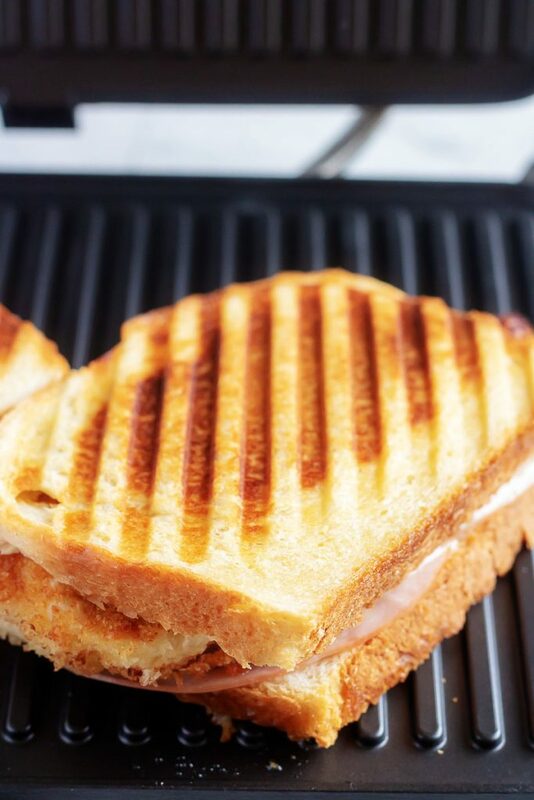 On a panini press heated to high, the sandwiches are cooked and pressed to golden brown, crisp on the outside but melted on the inside, perfection. It’s a thing of magic to watch, and it’s even more magical to enjoy! 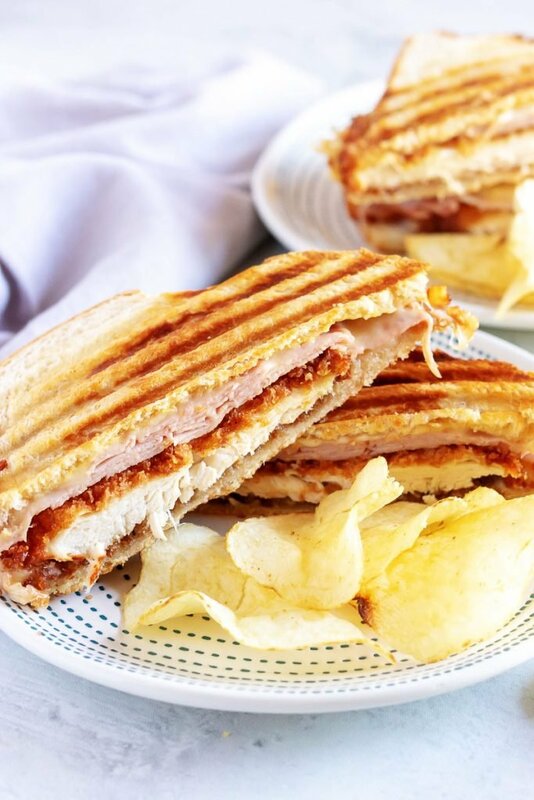 This Chicken Cordon Bleu Paninis recipe is basically everything you love about Chicken Cordon Bleu and its flavor profile, stuffed into a crisp, crusty grilled panini. And it is everything! It belongs in the sandwich hall of fame, for sure. 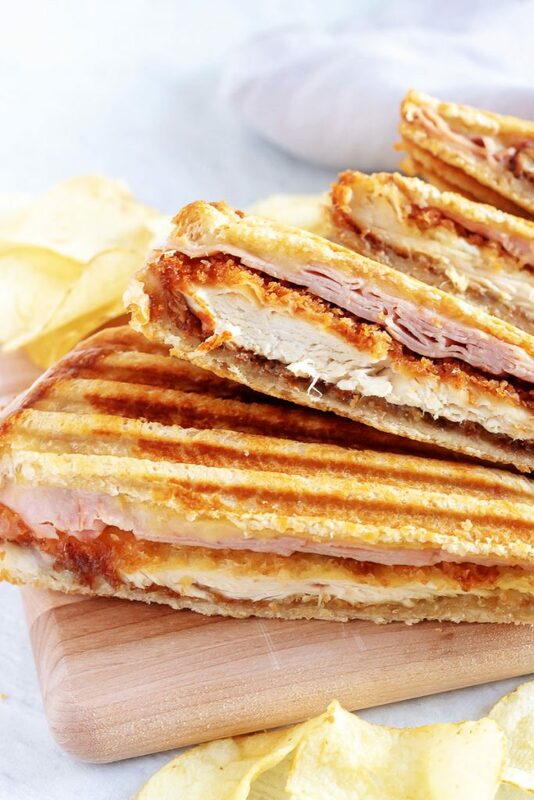 The flavors you crave in the classic chicken, ham, & Swiss cheese combo, but stuffed into a crispy grilled panini sandwich. Place the flour, egg, and panko each into separate, shallow bowls. Whisk the egg slightly to blend it together. Season each piece of chicken with salt and pepper, and then coat each piece in flour, egg, and panko, in that order. Set the breaded chicken aside. Heat a few tablespoons of olive oil in a large skillet over medium heat and add the chicken. Cook until the chicken is cooked through and golden and crispy on each side, about 4 minutes per side. Remove the cooked chicken from the pan and set aside. To make the panini, take the ciabatta rolls and slice them in half lengthwise. Butter the top and bottom of each roll, yes the OUTside. Next spread a little mustard on the bottom half of each roll, the inside of the bottom half. Layer on the cheese and ham by placing a slice of cheese on both the bottom and top pieces, and a piece of ham on just the bottom. Next, place a piece of chicken on the bottom half of each sandwich. 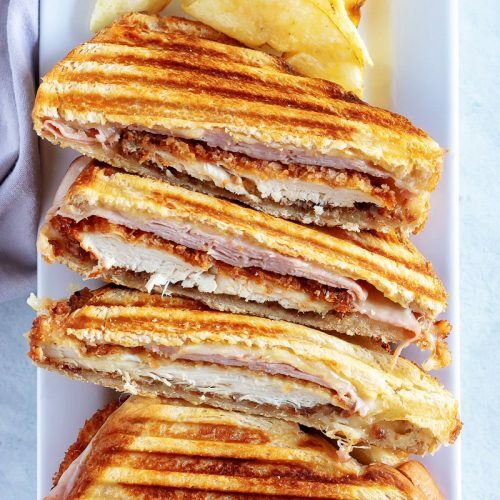 Top the sandwiches and move to the panini press. Pressing down on the panini press, grill until the sandwiches are golden brown and the cheese is melted, about five minutes. Serve warm, and enjoy! These look irresistible – that crispy chicken is making my mouth water! This looks like a wonderful, quick meal for chilly evenings. Yep, they pretty much inhaled them and had to be reminded to chew, and ya know- breathe, in between mouthfuls. 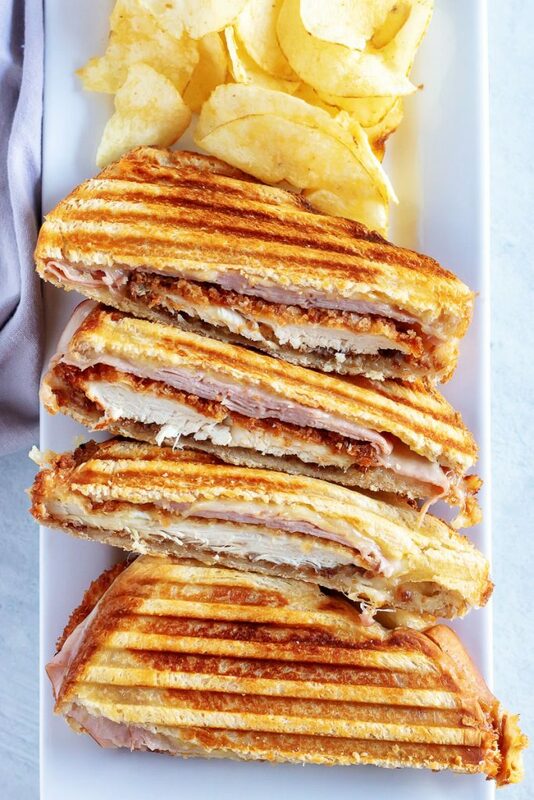 I have to take out my panini maker from its hiding place and make this!! Thank you for sharing at this week’s special Fiesta Friday party! Using my panini maker is my favorite way to make sandwiches. I like the way it crisps up the bread and makes the inside gooey and tasty. I like cordon bleu chicken as well. Thanks for coming to the party and sharing with Fiesta Friday.